My awkward phase lasted longer than almost anyone’s. In many ways I’m still in it, but for a good long while there, I was truly, pathetically fourteen. I was in the twelfth grade before my skin cleared and the gap in my front teeth finally closed up and I stopped being so sweaty. I compensated by embracing my weirdness, by painting butterflies on my face and covering myself in glitter, by learning to be funny, and by winning all the nerd contests. Speech meets and writing contests are what you do when you aren’t good at sports and sweat more than is socially acceptable anyway. I believe that if you’re going to be weird, not that you can help it anyway, then you shouldn’t hold back. Enjoy it. Wow them with your weirdness. Make them uncomfortable with it. Do whatever you have to do to make yourself comfortable with it, even if it means that you won’t be homecoming queen and the popular girls will sneer at you and say mean things about your sparkles when you pass them in the hall. It might be a stretch, but there’s a point in here somewhere. I promise. Celeriac always wows me with its weirdness. At first glance, it’s an abomination. 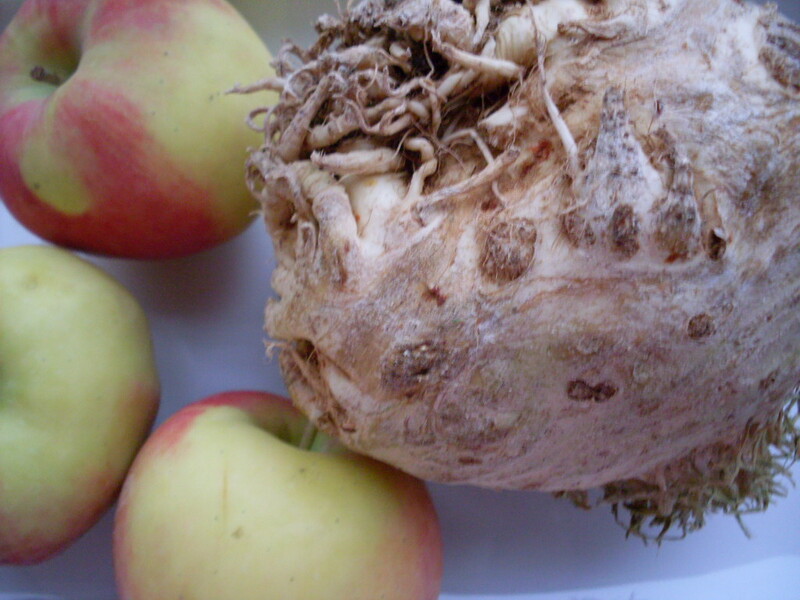 It’s dirty and rooty and nobbly, and it doesn’t make any sense – what do you do with celeriac? How do you eat it? To see it is to be puzzled, I think, at least the first time. It isn’t obvious what you’d do with it. It’s the most awkward vegetable, and easily ignored and abandoned in favour of potatoes or carrots or even beets – easy vegetables whose purposes are obvious. And at the risk of saying something hideously trite or drawing some after-school-special conclusion you’ll suspect somehow relates to me (it does not ), many people never think about what’s inside that grotesque exterior. Inside, celeriac is actually one of the best vegetables. With a pronounced celery taste and silky texture, it’s a vegetable that suits purées, gratins, and soups. That is to say, it’s one of fall’s most delightful treats, and I think you should make soup of it, sooner rather than later. To peel it, cut the ugly parts off with a large knife. It might be in its awkward phase, but it may still surprise you. In a large pot over medium-high heat, sauté onions in olive oil until just browned. Add celeriac, apples, and garlic, and stir until celeriac has begun to sweat. Pour in stock. 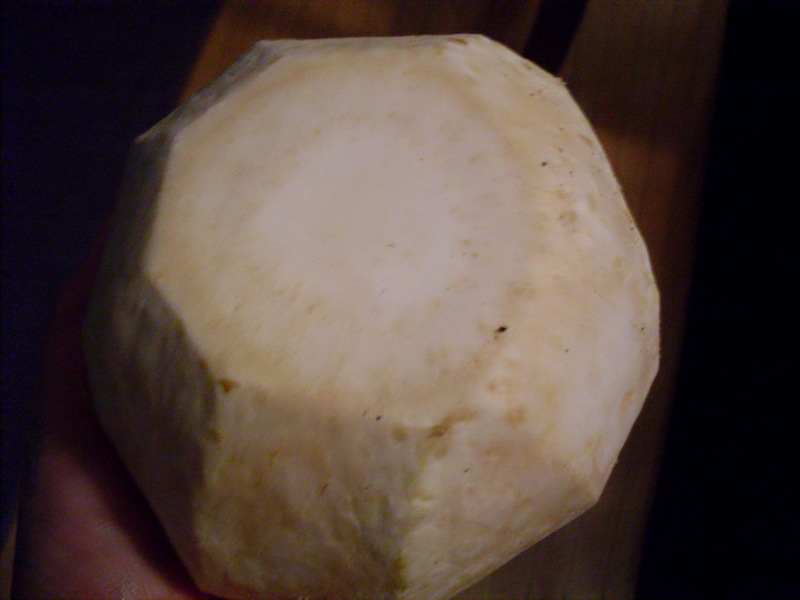 Bring to a boil, then reduce to medium, and simmer for ten to 15 minutes, until celeriac is tender. Remove from heat, and purée using a blender or hand blender until smooth. Return to heat. If it is too thick for your liking at this point, you can thin it a bit with additional chicken stock or water. Add pepper, nutmeg, and then taste. If you have used very sweet apples, you may find that the soup is a touch off-balance – if you need to, add the vinegar. Taste again, and add salt as necessary. Before serving, finish the soup with the cream, stirring until combined. 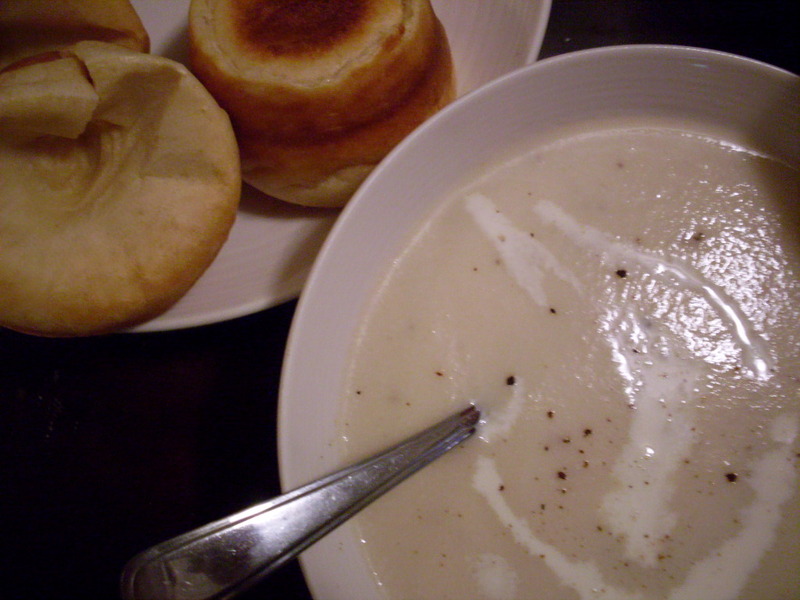 Drizzle with cream or good olive oil and serve hot, with bread. < Previous Chipotle macaroni and cheese. Yes! Celeriac is my favorite and my best. But look at those popovers in the background! I want those now! Okay, that 14-year-old picture is adorable. 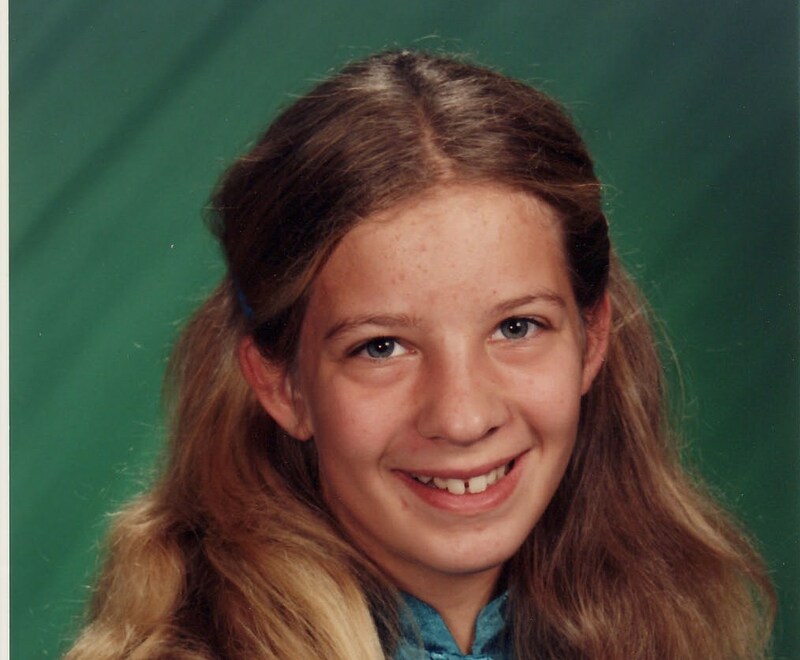 I was big and gangly and sweaty and redheaded and had a bad reputation (mostly undeserved) and was oh so spiritual, and never wore shoes and often wore my dad’s polyester ’70s button down shirts (a foot too long for me), and dyed my hair fire-engine red. So I totally get where you’re coming from. But, how cute! Celeriac… my mom used it to make purees resembling mashed potatoes when she was on a low-carb kick and I looooooove the flavor. I haven’t done much else with it ever: now I want to try it with apples. Now. Like a Waldorf salad soup, I bet. 🙂 I wonder how it would be with walnuts for garnish? You are awesome and darn cute! Where are those mean girls now? Probably breeding with something earning minimum wage at the mall if he stuck around at all. I’m proud of your nerd awards as was your Grandfather and Dad. Never change! Love your blog! I made this soup this past weekend and topped with some crispy sage and a drizzle of the sage oil. Thanks for sharing! Thanks! I love the idea of using crispy sage. I’ll need to try that next. Thanks for visiting!